Do you eat a bowl of oatmeal or cereal in the morning? Simply throw in a handful of blueberries or slice up a banana for an easy way to boost your daily fruit intake. If you don’t have fresh fruit on hand, add about ¼ cup of raisins or other dried fruit. Even though fresh fruit is lower in calories, eating dried fruit is certainly better than no fruit at all. 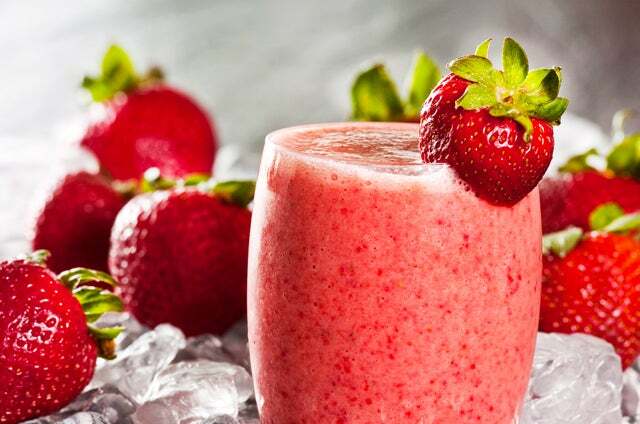 Drinking a smoothie is a good and delicious way to consume more fruit! Most smoothies have at least two servings of fruit in them, depending on how they were made. For instance, those made with a handful of fresh berries and one medium banana definitely include two servings. If you want even more fruit, add another handful of berries, use a large banana, and serve it in a bigger glass – that’s at least three servings of fruit! Fruit salads are easy to make and there are fun ways to step them up a notch! By blending common fruits with other interesting ingredients, such as herbs, it turns the fruit salad into an exciting dish. Approximately one cup of fruit salad is one serving of fruit. Serve with a dollop of whipped cream or a scoop of ice cream to turn it into a more decadent treat. Do you avoid eating fruit simply because you’re bored with the same old options? Make it a point to try something new! For instance, if you’ve never eaten a fresh coconut before, buy one the next time you go to the store. Who knows, your new favorite could be at the store right now, waiting for you to discover it. Once you find a variety of things that you like, it will be much easier to eat more fruit. The next time you’re craving something to snack on, reach for fruit instead of your usual choices! By storing it pre-washed and cut up in the refrigerator, it will make eating fruit for a snack much easier. Pair it with nuts or a small piece of cheese for an even more satisfying snack. If you’ve never incorporated fruit into your meals, you’re missing out! Fruit is a delicious ingredient in various savory dishes, such as in salad, when served with meat, and even as a main ingredient in sautés! Just because fruits are typically on the sweet side doesn’t mean that they need to be served only when sweet cravings hit. Incorporating more fruit into your diet doesn’t need to be difficult. By following these strategies, you can easily get in more servings of fruit each day!